Detailed oil lamp similar to those used in biblical times, made in the Holy Land; pottery with raised detailing. Includes a length of wick and opening for flame. Irregularities and smudges are indicative of this handcrafted lamp, which is functional. 4" x 2.5" approximate size. Visual aid for Sunday School, Bible class, or family use. 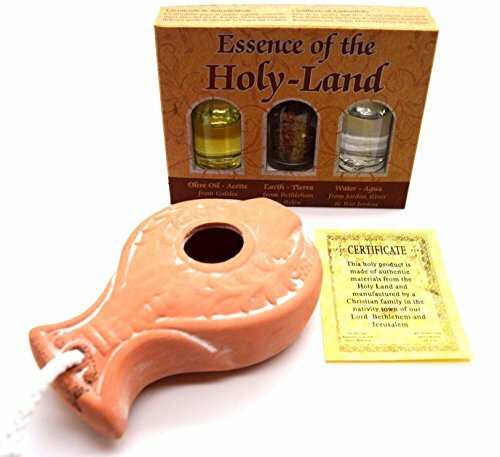 Comes with Essence of the Holy Land gift boxed Olive oil from the Galilee, Earth Soil from Bethlehem and Holy Water from the Jordan river in three glass bottles made in Israel. If you have any questions about this product by Holy Land Mall, contact us by completing and submitting the form below. If you are looking for a specif part number, please include it with your message.